I would like to join my colleague Rolph Payet in welcoming all of you here this morning. It is my pleasure to have this opportunity to address this meeting of the three Conferences of the Parties to the Basel, Rotterdam and Stockholm Conventions. Rolph has provided a global perspective on the importance of chemicals management and highlighted some of the key challenges facing the Conventions and the issues that you will be addressing over the next two weeks. In preparing these brief remarks, I thought it would be important to use this opportunity to provide some background information as further context for your deliberations, and to highlight the importance of the three Conventions and the urgency of your work before you. Agriculture has a major impact on the environment while the environment and the services it provides are essential to the future of agriculture. The world’s population is projected to reach 9.2 billion in 2050. This will require a 50% increase in global food production. Some 80% of this increase will need to come from land that is already under cultivation. So we need to produce more food per unit of land – essentially intensify production. From the 1960’s to the 1980’s the Green Revolution in Agriculture, and it’s input intensive approach to production, helped to reduce the number of undernourished people in the world, drive rural development and saved large areas of fragile land from conversion to extensive farming. But these achievements came at a high cost. In many countries, decades of input intensive agriculture have degraded fertile land and depleted groundwater, eroded biodiversity, and polluted the air, soil and water. It is clear that this input intensive approach to food production is not sustainable nor viable. Yet today there are nearly 800 million people in the world that go to bed hungry every night. About 75% of the worst affected live in rural areas of developing countries with livelihoods that depend directly or indirectly on agriculture. They include many of the world’s half a billion low-income small holder farmers who produce 80% of the food supply in those countries. These smallholder farmers and rural poor are the same people who are at greatest risk from the uncertainties of climate change and most vulnerable to the adverse effects of hazardous pesticides, chemicals and wastes that are the focus of the three Conventions. The adoption in 2015 of the 2030 Agenda and the Sustainable Development Goals (SDGs), as well as the Paris Agreement on climate change, put food security and agriculture at the center of the global development agenda. Recognition of the critical importance of agriculture is also reflected in the outcomes of both the United Nations Climate Change Conference in Morocco (COP22) and the United Nations Biodiversity Conference in Mexico (COP 13) in 2016. It is clear that agriculture in 2017 and beyond must produce more while at the same time protect and enhance the underlying natural resources on which it is based. The challenge is complicated by recognition of the fact that there is no silver bullet or one-size-fits-all solution to sustainably increasing agricultural production. Successful approaches are context specific and must be tailored to the needs of particular regions or communities. So we are moving from an input intensive approach to production to one that is knowledge intensive. The need for more varied, specialized and innovative approaches, that draw on traditional knowledge and advances in science and technology will only be addressed though greater collaboration and cooperation at all levels. This includes within countries, between communities, Ministries and agencies but also between countries through south-south cooperation - sharing knowledge, experience and expertise. 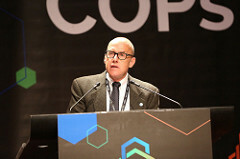 One example of such cooperation is the joint secretariat provided by FAO and UNEP for the Rotterdam Convention, a unique arrangement across UN bodies that builds on the best of both. The colocation of the Secretariats of the Basel, Stockholm and UNEP portion of the Rotterdam Convention here in Geneva is another example. The synergies that have resulted from these innovative secretariat arrangements for the three conventions is one of your topics for discussion. FAO is the lead international organization working on the sound management of pesticides throughout their lifecycle. The work of FAO on capacity development and institution building in support of sound pesticide management helps ensure a governance framework in countries that reduces the risks to human health and the environment from pesticides and associated wastes. Such national frameworks facilitate countries working together at a regional level and enable countries to take full advantage of global instruments like the Basel, Rotterdam and Stockholm Conventions. Finally I would like to draw your attention to the fact that over the next two weeks the Technology Fair and more than 40 side events will provide us with opportunities to learn more about partnerships, to share knowledge and experiences and to explore opportunities for strengthening collaboration in working towards the sound management of chemicals and wastes and a detoxified future. In closing, I would like to join Rolph in thanking the Swiss government for their warm welcome and continued support and in recognizing the professionalism of the Secretariat staff from Rome and Geneva who are for the most part working behind the scenes to make this triple COP a reality. I look forward to working with you all over the next two weeks.